Examination of regional trends in spring snow-cover duration from 1969–2003 using NOAA snow-cover data shows the western United States to be among the regions with the strongest decreases. This supports results from studies based on measurements on the ground. 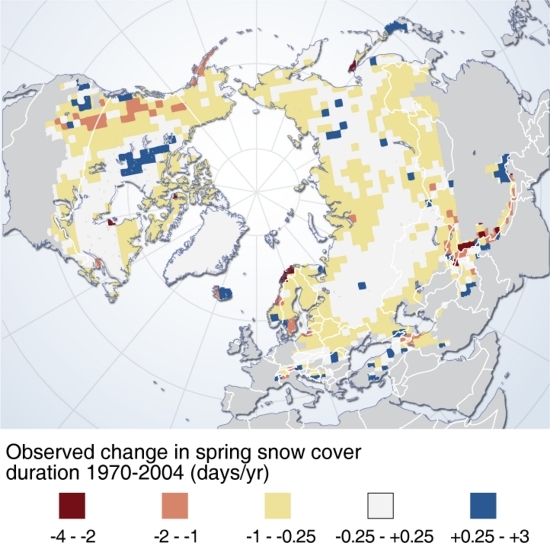 Springtime snow cover shows a decline particularly in the Pacific Northwest region of the western United States, where snow water equivalent, a common snow cover measurement equivalent to the depth of water which would result from snow melt, has drastically decreased. This decrease is attributed to an increase in temperature; observations of temperatures in the western United States already show warmer winters. Changes, presented in this figure, exceeding ~ ±1 represent significant local changes at the 95% level. Greenland was excluded from the analysis.